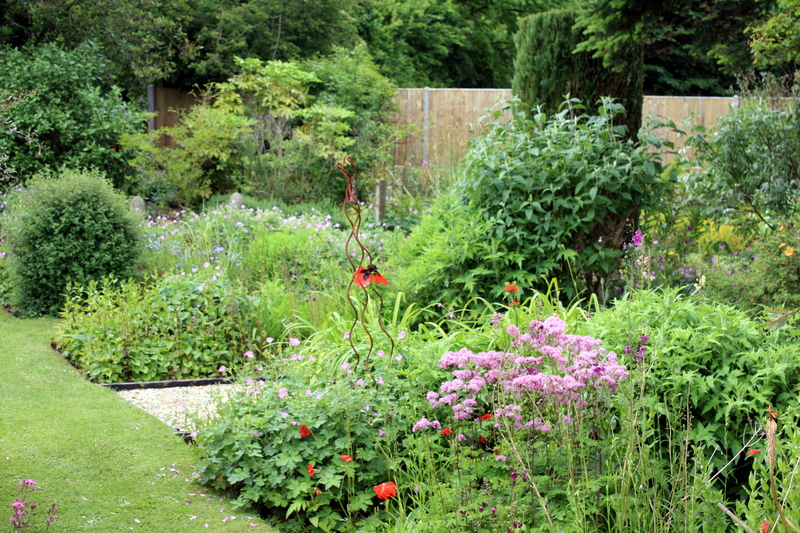 The National Gardens Scheme is an absolutely wonderful charity, allowing gardeners and garden lovers access to thousands of private gardens across the country every year. Participating gardens come in all shapes and sizes, offering everything from high horticulture to naturalistic and ecological styles. What all the gardens offer is a rare glimpse into a nation’s passion for gardening. You can admire or criticize as much you like, but in the end these are personal spaces, cared for and cherished by the owners, for the owners, and not principally for visitors. Hence you may not find lots of sitting places, well labelled plants, wheelchair ramps and ‘Keep off the Grass’ signs, but there will always be something to learn and admire. Windy Ridge is sited in the middle of chalk farmland, not far from The White Cliffs of Dover, and was open just once this year on June 23rd. The first thing to note is that access is along rutted farm tracks and therefore not ideal for certain sports cars. We still have a goodly amount of the Kent countryside stuck in our tyres and under our mud flaps! Once parked, we paid up (all proceeds to charity) and entered a garden that’s absolutely crammed with unusual and interesting plants. One has to admire how the owners have created shelter in this exposed position, with very little between the garden and open sea. The hedges around the property are thick and well maintained, protecting tender plants from the ravages of the weather. 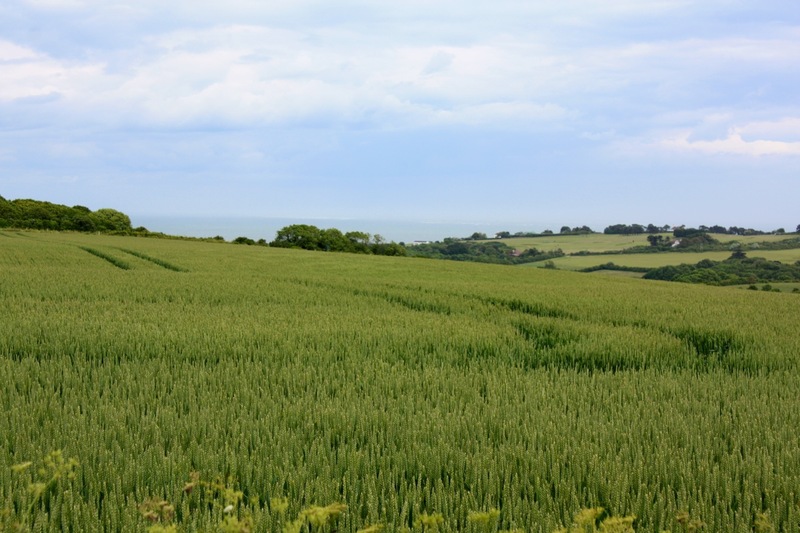 The picture at the top of this post shows the view from a corner of the garden, across wheat fields, with the English Channel in the distance. Island beds surround a small bungalow and overflow with mixed plantings of trees, shrubs and perennials. 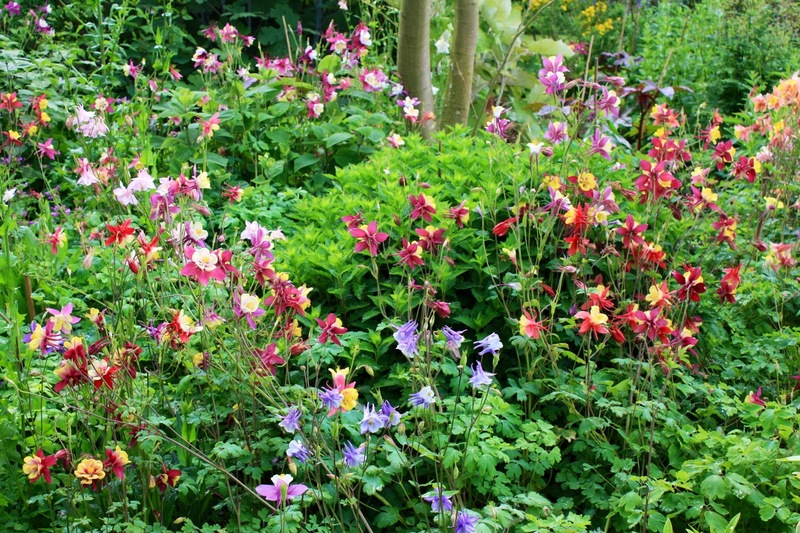 Aquilegias, normally over and done with by late June, were in their prime. They stood firm despite the heavy showers that set in as soon as we arrived – don’t you just love the English summer? The owners used to run a nursery on the site, but since retiring in 2012 have extensively remodelled the garden to incorporate the redundant space. There are informal island beds, colour themed herbaceous borders, a wildlife pond, kitchen garden and woodland planting. None of these features is particularly big, and a lot is packed into small space. I was very envious of a large, light and airy potting shed. My idea of the perfect retreat, especially on a rainy day. One doesn’t expect to find everything clearly labelled in a private garden, but Windy Ridge had lots of plants which I couldn’t identify – a good test for me and a reminder of how much there is to learn in the world of plants. 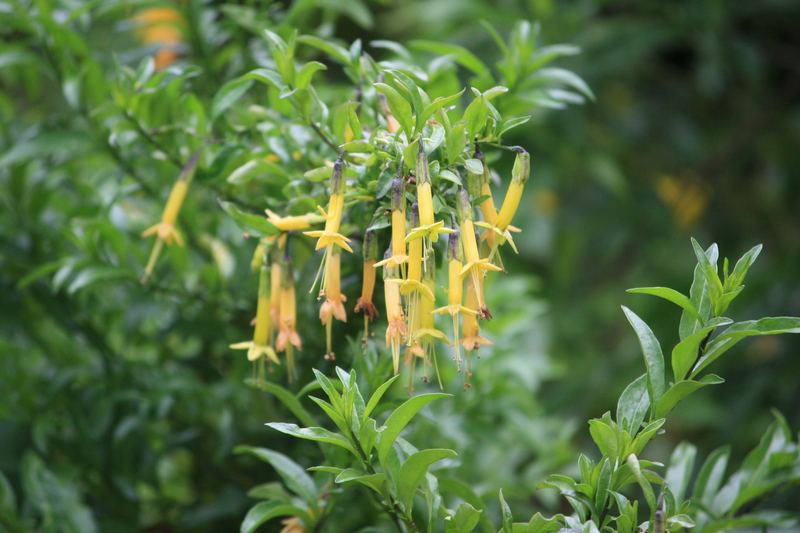 I was not sure if the shrub pictured below was a Fuchsia, or maybe a Phygelius. 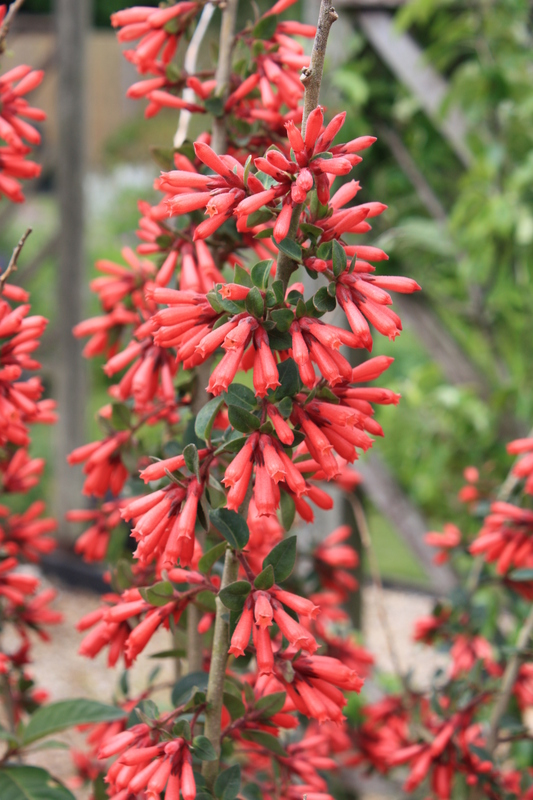 Turns out it’s Cestrum elegans, a plant which makes a huge statement, with branches about 5ft tall covered in red tubular flowers through summer. An absolute show-stopper. Smaller, and languishing in a quieter corner of the garden, was another interesting plant, this time with greenish tubular flowers. Thanks to Gill Heavens of Cliffe in Devon for identifying this as Vestia foetida. Vestia foetida – an evergreen shrub with pungently scented foliage. 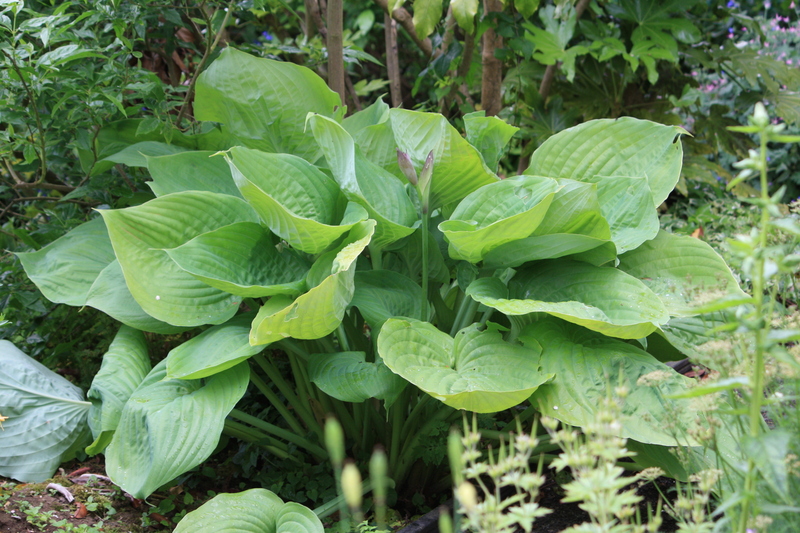 It was a relief to stumble across a plant I did know, the mighty Hosta ‘Sum and Substance’. The huge, thick, corrugated leaves are quite resistant to the attentions of slugs and snails, so this specimen was looking in great form. Nearby I spotted this unusual herbaceous geranium covered with spidery pink flowers. 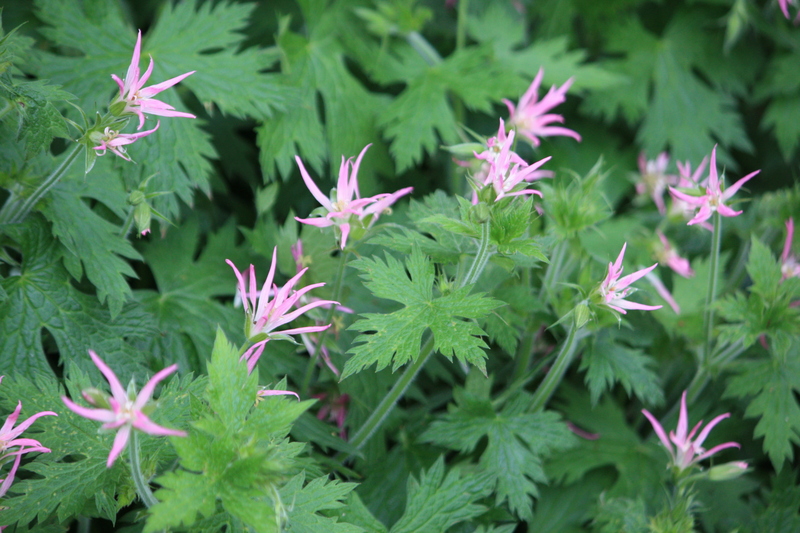 Although quite different from others I’ve seen, I would not choose it over the shocking magenta flowers of Geranium psilostemon which was planted on the other side of the path. 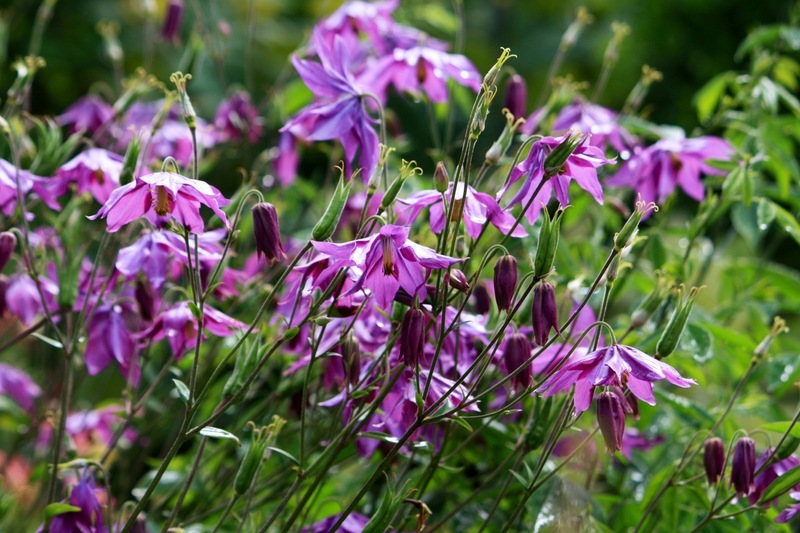 Windy Ridge is definitely a plantsman’s garden first and foremost. The layout is not very coherent and there are too many single plants crammed in for my liking. But it’s not my garden and that’s the point. 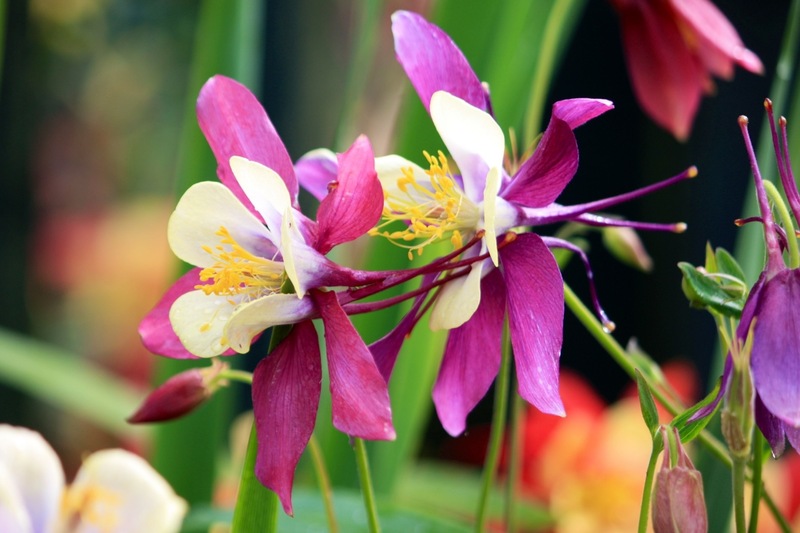 It reflects the owner’s passion for unusual, interesting, challenging plants and must give them a huge amount of pleasure. I took away from it an appreciation of the importance of creating shelter as well as lots of photos of plants that I’d like to identify in due course. Hopefully Windy Ridge will be open again next year for anyone who’s interest has been piqued by this post – just take the Land Rover, not the Porsche! The yellow plant is Vestia foetida. We grow it at Cliffe, a lovely but stinky plant! Hence the foetida! Thanks for that – it’s really frustrating when you can’t work out what something is. Coincidentally today’s daily flower candy will be Iris foetidissima “Citrina”.